Facebook, Twitter, LinkedIn, Instagram go everywhere we go. We’re always connected. 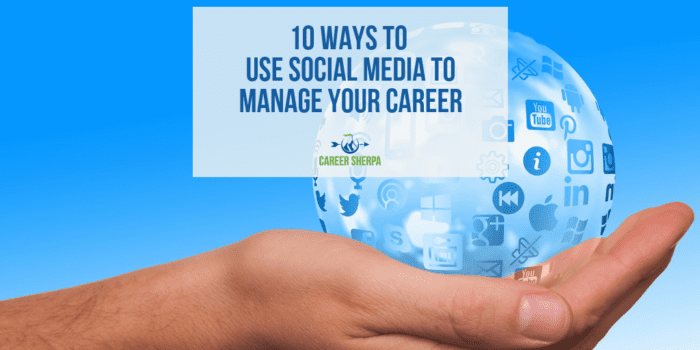 Why not use social media to help you manage your career! No matter where you are in your work life: recent college graduate, mid-career or closing in on retirement, “there is an app for that” as the saying goes. Social media is about word of mouth marketing, developing relationships and connecting with people. There will always be competition for jobs. The good news is that you don’t have to hire an ad agency to help spread the word about your talent and expertise. All you need is a goal. Use these 10 strategies to help you leverage the power of social media to expand your reputation of excellence. When someone searches for your name, you want them to find the best references online. Creating social media profiles is one good way to do this. You may also want to publish content, get mentioned in newspapers, and own your own domain (website URL). By staying up-to-date with what’s happening in your industry, you add value to your current organization and prepare yourself for future shifts. You may begin learning new skills or technology as a result of what you learn. Demonstrate you are “in the know” by regularly adding status updates to your social media accounts. Take the initiative and proactively give a shoutout or complement to people you respect. It goes a long way and shows you value them. You can’t expect reciprocity, but you may just get it. If you worry that you may be perceived as old, using social media is a fantastic way to debunk the myth that older workers are behind in technology. Do you know what type of status updates do best with your network? Every week or so, assess your progress. This may seem like a lot of work. But if you are already using social media, then most of these actions won’t take much more time. It just requires you have a goal to promote yourself and share your professional side.